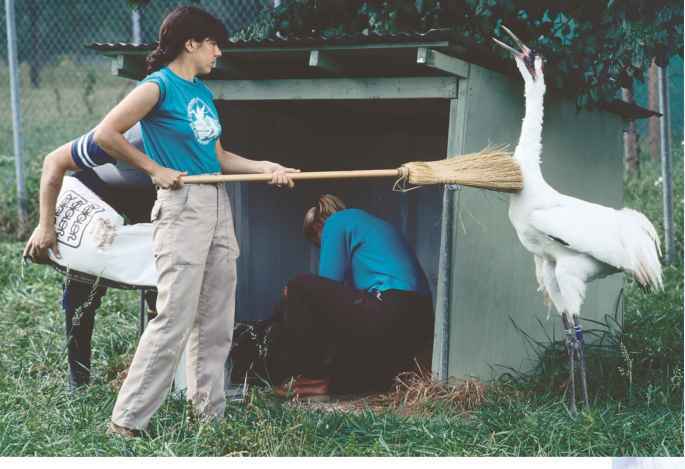 Conservation biologists are likely to lead projects such as this whooping crane breeding program located in Patuxent, Maryland. their habitats in ways that were previously unimaginable. The use of non-invasively collected samples, such as feces or hair, enables the conservation geneticist to acquire an extraordinary amount of information about life history, demography, distribution, and diversity of rare species without directly observing them. In addition to such studies, with research drawn from skilled geneticists, ecologists, and behavioral biologists, conservation geneticists are now faced with a new set of hightech approaches derived from the emerging field of genomics. The challenge for these biologists will be to evaluate whether these advanced technologies can be used effectively to promote biodiversity, conservation, and habitat protection.